Last season the barn swallows beat the bluebirds to the house and took it over. They nested in it last summer. Will the bluebirds use that nest or do I need to clean it out before they return? I would much rather have the blue birds nest there than the barn swallows. Bluebirds and Tree swallows both like to nest in the fairly open areas interspersed with trees and shrubs. Experts recommend that bluebird boxes be 5 feet high and spaced at least 300' apart facing east or southeast. To reduce the competition between bluebirds and swallows for houses it is recommended to pair houses. Setting up a pair of houses, with each house no more than 5-10 feet apart every 300 feet, is one proven technique that allows both songbirds to nest together successfully. 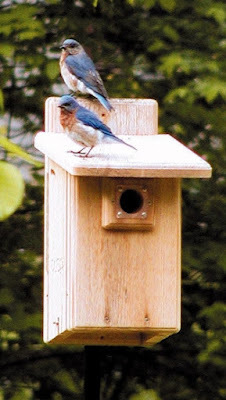 Pairing boxes has the advantage of allowing more birds of both species to coexist peacefully within the same habitat and battle any predators or interloping sparrows. More information on this technique can be found HERE. Bluebirds will not clean out old nests by themselves typically. 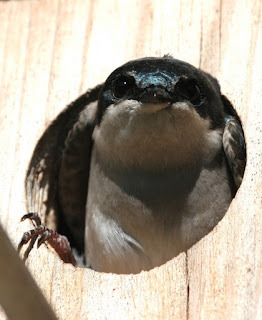 They may build a nest on top of another previously used nest, but this may promote disease and parasite infestation, and increases the likelihood that a predator will be able to reach in and nab eggs/nestlings that are closer to the entrance hole. It is best to clean out nestboxes in September so that when they are ready to nest again in the spring, the house is all set! If you didn’t get a chance in the fall, try to get out there before March to clean them out. Bluebirds can already be checking out houses in February and begin building new nests in March. They would never skip the building of a new nest and use an old nest, they would just build on top of an old nest. Both Eastern Bluebirds and Tree Swallows are beautiful native birds. While bluebirds will entertain us with their song, the swallows dancing and darting in the air is something to watch. Besides having fun watching these birds, farmers, gardeners, and others enjoy both birds because they are consumers of many pest insects.